Now an international speaker and New York Times best-selling author, Anita had been given mere hours to live by her doctors on the morning of February 2, 2006. Unable to move and in a deep coma caused by the cancer that had ravaged her body for nearly four years, Anita entered another realm where she experienced great clarity and understanding about her life and purpose here on earth. In that realm, she was given a choice of whether to return to life or continue on into death. Anita chose to return to this life when she realized that heaven is a state, not a place. Because of this awareness, she made a remarkable and complete recovery within weeks of coming out of the coma. When she shared her story of healing and the insights she gained from her experience in the other realm, it went viral on the internet, receiving enormous interest internationally. The 2012 book she wrote about her experience, Dying to Be Me (published by Hay House), hit the New York Times bestseller list within two weeks of its release, remaining there for nine weeks. The book has since been translated into 45 languages and has sold over one million copies worldwide. Anita’s new book, What If This Is Heaven? (find the book below), debunks 10 common cultural myths most of us have accepted without question that keep us from experiencing heaven on earth. Now completely cancer-free, Anita travels the globe, giving talks and workshops, as well as speaking at conferences and special events. Anita Moorjani is a teacher that truly resonates with me and I have followed her work for a long time. What I appreciate the most is that she is truly bringing awareness to the importance of SELF LOVE, which I believe is the most fundamental love. Everything starts with you. Looking for love out there, will only leave you in fear, fear of the love out there to leave you. When you love yourself, you feel complete within yourself and love will also flow naturally to you, because you are radiating the very same thing. Like attracts like. When you begin to love yourself, your whole life changes. I can warmly recommend to dive into Anita’s online courses and books below. Availability: Immediate Delivery. Just click on the picture to learn more. 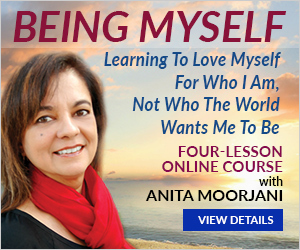 Join best-selling Hay House author Anita Moorjani, and special guest Dr. Wayne Dyer for a riveting Online Course that will radically alter your current beliefs about yourself, your purpose on earth, your health, your relationships, and your life! Wisdom From North is an affiliate with Hay House. Purchasing these products you support Wisdom From North without any extra costs.